This is beast ink. Stains super hard and leaves a vicious ghost that eats right through any buff paint, but it fades in direct sunlight :(. Sometimes i mix this with white rusto oil based bucket paint to make an awesome bright purple that doesn't fade, but it isn't as buff proof as the ink on its own. This stuff also smells like sh*t, but just do your handie quick and get the hell outta there. Im a give all you lil kiddies a school lesson bout why a marsh garvey mix is legit so pull up a chair and sit down. Now, Marsh is a highly pigmented ink. Anything Pigmented means its gonna very opaque and its not gonna FADE. BUT its not gonna be as hard to buff as a DYE based ink. This is where the Garvey comes in. 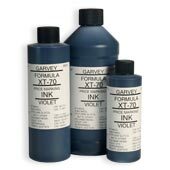 Garvey is hard staining dye based ink thatll soak into the surface of what youre writing on. And also dye based inks will bleed through some light colored paints which will still make it readable. If you combine the two you get the best of both worlds. Youll have a tag thatll nearly never fade away and when the buff buffman will try to paint over it itll STILL show through. 14 of 14 found this review helpful - did you? If you have a buff infestation, this is for you. I ran this thru a beast of a 1'' mop with a little bit of marsh to top it off. Completely worth the price. Half of my town gets buffed ridiculously fast, including my own street. So I got this and there hasn't been a single tag I've done with it that has been successfully buffed. Love those purple smears.